The SOHO is prepared for encapsulation in its payload fairing. 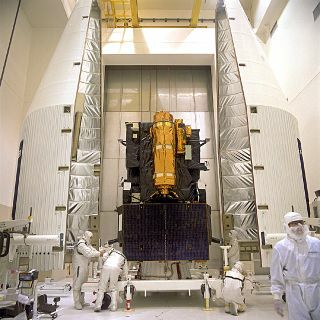 In this historical photo from the U.S. space agency, fully assembled, checked out and fueled for flight, the Solar and Heliospheric Observatory (SOHO) is ready for encapsulation in its protective payload fairing on Nov. 9, 1995. Note the protective thermal blankets encasing the spacecraft and the solar arrays stowed at the base. This will wrap up preflight activities in the Spacecraft Assembly and Encapsulation Facility 2 (SAEF-2). Once encapsulated, SOHO will be transferred to Launch Complex 36B on Cape Canaveral Air Station, where it will be mated to the Atlas IIAS expendable vehicle that will carry it into space on Nov. 23.